Noisestopper Acoustic Ceiling Pads are designed to be an easy solution to reduce noise travelling through suspended ceilings into adjacent offices and should be placed on top of the existing tiles. Best results obtained when used with NoiseStopper Luminaire Covers for above lighting. 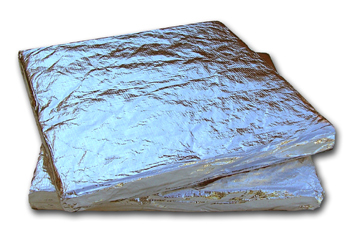 Noisestopper Acoustic Ceiling Pads comprise our popular SoundBlocker Membrane sandwiched between sound absorbing acoustic mineral wool and encapsulated in foil making the product clean and easy to handle. They are Class 0 fireproof and supplied in both 600mm x 600mm and 1200mm x 600mm pads which are made to order. For best results they should be used alongside our NoiseStopper Luminaire Covers designed to reduce noise leakage through suspended ceiling lighting so that the entire suspended ceiling is adequately treated with a noise stopping solution. Both products are lightweight and easily supported by a properly installed ceiling grid system. Will installation of Noisestopper Pads make a difference? When installed as briefly described above, yes they do make a difference and the reduction in noise nuisance from other adjacent offices will help staff perform better and make them less stressed. g walls stopping at suspended ceiling height. This means there is nothing above the suspended ceiling to stop noise from travelling through the ceiling over the wall and into adjacent offices. This can be particularly annoying if a confidential meeting is being held but now there is an answer by installing our NoiseStopper solutions. 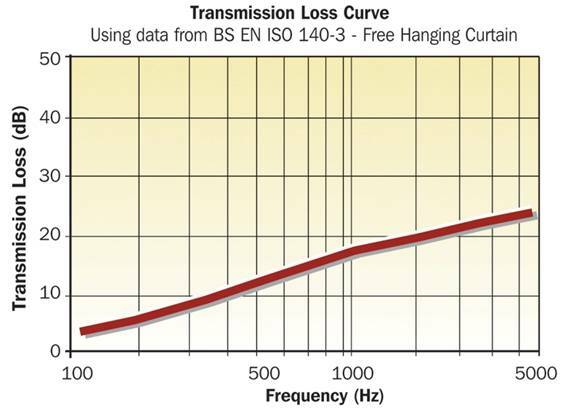 The graph alongside shows the efficiency of the NoiseStopper system when correctly installed. Obviously, if there are any areas above a ceiling that have not been covered, the results will be compromised. The NoiseStopper Luminaire Covers that should be used along with the pads are also supplied in the two sizes the pads are available in which is 600mm x 600mm and 1200mm x 600mm. PLEASE NOTE: AS THIS PRODUCT IS MADE TO ORDER IT IS NORMALLY DELIVERED WITHIN 7 – 10 WORKING DAYS. THERE IS A MIN QUANTITY OF 40 SMALL PADS AND 20 LARGE PADS PER ORDER ! !